Edinburgh has a host of fabulous attractions, from iconic Edinburgh Castle with the Crown jewels displayed to the National Museum of Scotland & great theatres offering excellent shows . 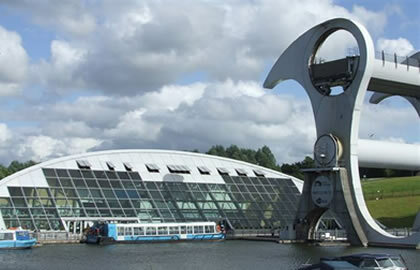 The marina is adjacent to the magnificent Falkirk Wheel visitor centre. The Falkirk Wheel is one of Scotland's top tourist destinations and attracts visitors from all across the World, one of the most stunning backdrops anywhere on the canals, . The Falkirk Wheel is 115 feet high – the equivalent height of eight double decker buses and offers visitors a real treat. It is 115 feet wide and 100 feet long. The wheel will lift loads of 600 tonnes (300 at each end) and stands in a 330 feet wide circular basin with moorings for over 20 boats. Before re-development, the site was a deep open cast pit left behind by mining which ended in the early 1980s. The total project cost was approximately £17 million and work took 22 months. The wheel is designed to last for at least the next 120 years. It is the world’s first rotating boat lift and the first boat lift to be built in Britain since the Anderton Boat Lift in Cheshire, which dates from 1875. Linlithgow is a town with an ancient and distinguished history. Linlithgow Palace was a favourite home of the Stewart kings and queens and was the birthplace of Mary, Queen of Scots, and Linlithgow itself was an administrative centre for many centuries. From 2018 a Rover Ticket will be charged by Scottish Canals for use of the canals. This will be a flat charge of £25 for any holiday over three nights. Use up to three days will be charged at £15. This Ticket will be administered by Scottish Canals through their website and office. Payment will be taken on the first day of the holiday at the office in Falkirk. It is imperative you bring a mobile phone and a 3-pin plug charger. If you do not have a phone, you can rent one from the Falkirk Base at a nominal charge. You will need to contact the Falkirk Wheel staff to arrange return passage through the wheel and to contact other Scottish Canals Boat Movements staff if and when required. You do not need to book your outgoing passage through the Falkirk Wheel as your passage will be booked by the Falkirk marina staff as part of your handover. As soon as you are ready to leave, they will put you in whatever queue there might be for the Wheel. The wheel closes at 6.00pm in June, July and August. From March to May and September, October the wheel continues to close at 6.00pm on Fri/Sat/Sun but 5.00pm Mon – Thu. However all boats must be in the system by 5pm and 4pm respectively. There is a short journey towards Linlithgow from here, the winding high street is full of character and plenty of choice for restocking provisions but by far and away the highlight of this pleasant little town is the staggering loch side fortified palace and adjoining church of St Michael. Whichever angle you view the palace ruins from it is astoundingly beautiful, the mind boggles at the sheer opulence of the castle and the surroundings and views offered up. Linlithgow is a town with an ancient and distinguished history. Linlithgow Palace was a favourite home of the Stewart kings and queens and was the birthplace of Mary, Queen of Scots, and Linlithgow itself was an administrative centre for many centuries. Today the town is bypassed to the north by the M9 but remains an exceptionally busy place: and it retains enough of the character and charm of its past to place it high on any list of "must visits" in central Scotland. The train station is next to your moorings in this lovely town and for those on a 3 nights trip you can take the 30 minutes trainride into Edinburgh , as trains leave every 20 minutes. It is under under 4.5 hours to get here from Falkirk Marina, so plenty of time to get the train into Edinburgh and do some more sight-seeing, and then cruise just 4.5 hours back to Falkirk again. There are many attractions in Edinburgh. On your return journey it is important to remember that at the Glen High (Laughin’/Green’) Bridge you will need to call the Falkirk Wheel on 01324 676912 to arrange your travel back through the wheel (approx. +2 hrs cruising time from Falkirk). In order to arrive back in good time you will have to be back at base the evening before you disembark. This means being at the top locks at 4pm ready to transit back down the Falkirk Wheel that evening. This is due to the Falkirk Wheel not operating before 10.00am, as daily safety checks are carried out before hand.